With this snack pack we're sought out the best flavors with the most nutrition that you and your family can enjoy! Making the perfect care package for college students, friends, co-workers, and everyone in between! Eating healthy has never been so easy! *All snacks are handpicked & shipped loose in custom variety box (Not in Manufacturer's Packaging). In the event a certain snack is not in stock it will be replaced with a similar product. Whether snacking at home, out on-the-go or during the workday, The LA Signature's Premium Send and Share Variety Snack Box keeps high quality items within reach! Get convenience and value together with pre-portioned versions of your favorite snacks. Enjoy them yourself, or share with friends and family that are trying to snack smarter! Send and Share Variety Snack Box Mix delivers the sweet and salty flavors you crave without overindulging. 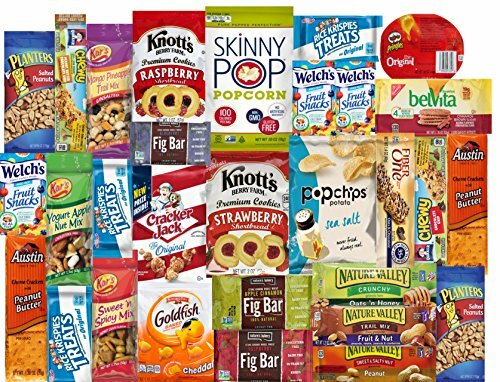 Every Premium Package Come full of 30 best top brands and flavors you love and includes: - 1 Popchips - Sea Salt - 1 Skinny Pops - 1 Nature Valley Sweet & Salty Peanut Bar - 1 Nature Valley Trail Mix Bar - 1 Nature Valley Honey Oats 2 Pack - 1 Kar's Sweet & Spicey Nuts - 1 Kar's Yogurt Apple Mix - 1 Kar's Mango Pineapple Mix; - 2 Planters Peanuts Salted - 1 Belvita Cinnamon Biscuits - 1 Goldfish Crackers - 1 Knott Berry Cookies Strawberry - 1 Cracker Jacks Caramel Coated Popcorns & Peanuts - 1 Knott Berry Shortbread Cookies Raspberry - 3 Welch's Fruit Snacks - 1 Chee-It Original Cheddar Cheese - 2 Quaker Chew Granola Bars - 2 Austin Cookies Cheese Crackers with Peanut Butter - 1 Pringles Original; - 3 Kellogg's Rice Krispies; 1 Fiber One Bars; 3 Nature Bakery Fig Bars Pack of 2. Each box is filled with 30 convenient single serve items of your favorite Top brand snacks making it easy to snack anywhere. Healthy snack box includes a flavorful mix of nutritious savory and healthy spicy snacks. Snacks for kid's, athletic snacks and more! Great for Holidays, birthdays or housewarming gifts too!